Panasonic Energy Corporation of America is the U.S. headquarters for Panasonic batteries, located in the second largest city in Georgia, the historical city of Columbus. Nestled in the heart of Muscogee county, the Panasonic hub of battery know-how consists of three state-of-the-art battery divisions. The Sales and Marketing division houses a packaging center, a warehouse and administrative offices which include Customer Service, Marketing, Packaging Development and Supply Chain. The Lithium battery division is the largest manufacturer of primary cylindrical lithium cells in North America. 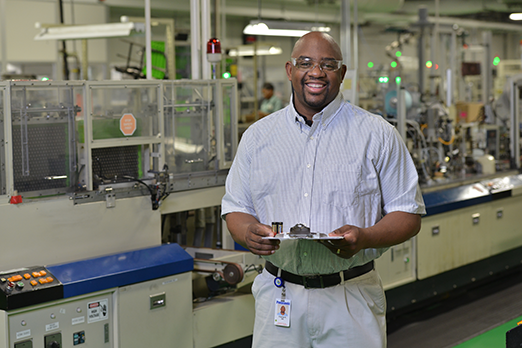 The Materials division manufactures battery components for customers worldwide. Using stringent controls and advanced production techniques, Panasonic factories produce batteries to the highest quality and performance standards. Since 1931 Panasonic has been the trusted brand of choice for people around the globe. In the USA, our extensive product portfolio provides powerful solutions for a wide range of devices. Our feature brands are eneloop, eneloop pro, Platinum Power, Alkaline Plus Power, Lithium and Super Heavy Duty Power. Today’s market is fluid, ever changing and customer focused. To address customers’ various requirements, we provide localization as well as market and customer focused solutions. Our packaging flexibility and design expertise allow us to create tailor made solutions expeditiously. Excellence is at the heart of our business with quality, performance, safety and reliability as the key foundations. Whether it is a unique pack, a display or customized marketing material; our team will deliver the right product to fully satisfy customers’ standards and expectations. From the banks of the Chattahoochee River to the shores of the Beaufort Sea, we want to power your experience.